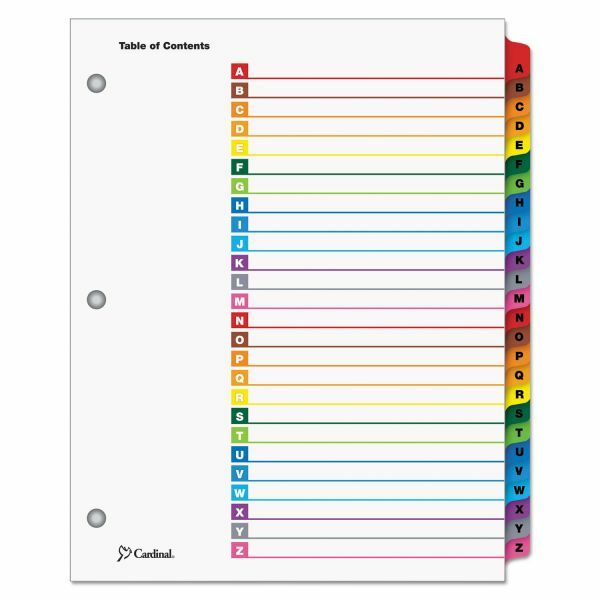 Cardinal Traditional OneStep Index System, 26-Tab, A-Z, Letter, Multicolor, 26/Set - OneStep Index System instantly creates custom index sets by printing onto the included Table of Contents sheets. 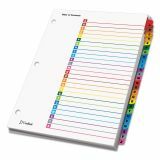 Matching, preprinted tabs on the divider sheets can be used in either portrait or landscape formats. 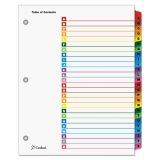 Multicolored tab sets have coordinating, multicolor, Table of Contents sheets. Easy-to-use, free templates in your favorite software are available online. Tabs and ring edges are reinforced to withstand heavy use. Three-hole punched indexes are compatible with laser or inkjet printers, as well as standard typewriters. Tabs are labeled from A to Z for alphabetical indexing.